This piece was a two-part stone lithograph drawn by hand on two stones, which is a really interesting and odd process that I only got a chance to try out twice during the short time I had access to the materials. The image on the left contains a quote from Neil Gaiman’s Sandman series about his character of Death, and that’s the quote which I used to title the whole piece. On the right, we have a quote from the Joy Division song “In a Lonely Place,” which was quoted in the original comics for The Crow — the second comic series I ever collected (the first was Bill Sienkiewicz’s Stray Toasters). 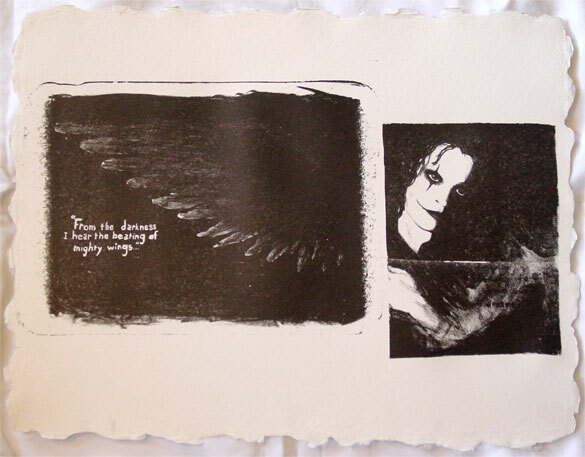 The image, of course, is of the main character from the comic and later movie, and has a pattern of wings overlaying the shadows, a match to the outspread wing in the first panel. There are a lot of hidden things here about death and myth and meaning, but also about art and inspiration, and the process that artists of all sorts go through, amalgamating all the art they consume, the culture around them and the facts and trivia they learn, and putting it through the mill of their own experience. The Crow is littered with quotes from songs, The Sandman is rife with literary, historical and mythical references, and between them there is a small but coherent thread of death and flight and black wings that carry the soul away, that I’ve chosen to weave into this artwork. From the Darkness, I Hear the Beating of Mighty Wings, edition, 22″x15″ stone lithograph on watercolor paper. The print above on the buff paper was done in an edition of 26, of which I still have 6 (with some variation between prints owing to the process). I also have a single print on heavy natural-deckle handmade watercolor paper that’s one of a kind. No more of these can ever be made — the stones were long sanded down smooth and used for other artworks. 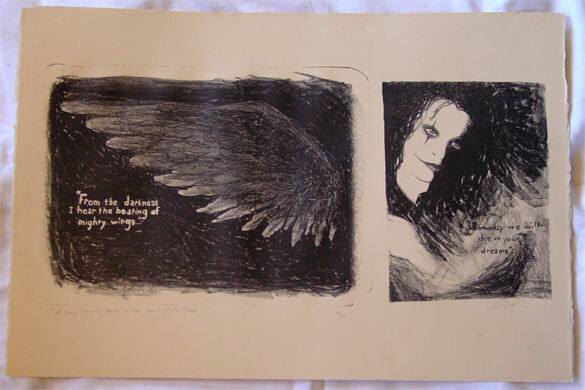 From the Darkness, I Hear the Beating of Mighty Wings, A/P, 22″x17″ stone lithograph on handmade watercolor paper.